Some of the greatest treasures on Spoon’s latest album– the embarrassingly titled Ga Ga Ga Ga Ga– are also some of the simplest: the crisp, clean crack of a snare drum; the pounding of an oddly-tuned piano; the rich, fluid splash of a crash cymbal. It’s an album for musical sensualists– folks who love the rich tones of old, acoustic instruments, who cherish the texture of a song and savor the little details. And there are little details aplenty here. Spoon has long had a reputation for being meticulous in their production, with not one note or sound effect that isn’t needed; thus, the flourishes of brass instruments here, the finely recorded percussion and overlay of guitar and piano, all contribute something to the tone and texture of the songs themselves. It’s these little details that make the album open up more and more with each listen; indeed, critics and fans are right to call this a masterpiece of studio craft. 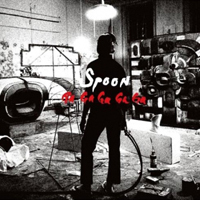 But if there’s one thing Spoon loves more than sound, it’s song, and Ga Ga has ten great ones. There isn’t a rock band working today that shows more passion and taste in the craftsmanship of great pop songs, and, for all the attention payed to detail here, the record never feels overly studied or academic. It’s a fast-moving, lively set of songs that pack a mean punch. If it’s the sonic details that keep you coming back, it’s the hooks that first reel you in. It’s as if the men of Spoon are on a quest to remind us of everything that’s great about the three-and-a-half-minute pop song, conjuring up the ghosts of everyone from Marvin Gaye to the Beatles in the process. Rarely does such a meticulously crafted album sound so warm and soulful. It’s not just an exercise in craft; it’s a celebration of song itself. Almost everything here is upbeat and hard-hitting; sample “You Got Yr. Cherry Bomb,” a pop singalong that’s as simple and as memorable of anything you’ll hear all year. Songs like that might remind some listeners of The White Stripe’s leftfield pop album from a couple years back, Get Behind Me Satan; both albums take the simplest of spare parts and put them together into something joyfully, contagiously listenable. But there are experimental numbers, too. Witness the second track, “The Ghost of You Lingers,” built around a simple piano refrain and distorted, echoing vocal loops. And then there’s “My Little Japanese Cigarette Case,” which builds a surprising sense of drama out of just a couple of lines of lyric. The best moments, though, come when the studio trickery and pop songwriting chops gel together, as on the brass-tinged, Jon Brion-produced ode to “The Underdog,” or the sample-laced, R&B-fueled “Finer Feelings.” It’s moments like these that manage to be both utterly surprising and cheerily familiar– much like the album itself.